Normally when games are called retro, it means pixels. Cuphead is going back further. It looks like an old Disney cartoon, complete with distinctive palette and visual imperfections. It's a beautifully animated singleplayer and co-op platfomer, following Cuphead and Mugman as they make the most of an ill-advised deal with the devil. I implore you to check out this trailer. 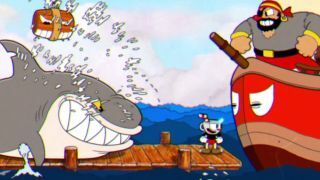 Cuphead is due out next year, and, despite being labelled as an "Xbox One Console exclusive", the game's own website states that it's also coming to Steam.